The Beast is the book that has restored my love for this long running series. To begin with I had my reservations, as once again it seemed that the book was going to be a repeat of The Shadows. However, it soon became apparent that this book was much, much more. The thing that I really liked about this book was that it centred on well-established characters that I had built up a strong affection for over the last 14 books. The main focus of this book was on Rhage and Mary and the cracks or friction that has appeared in their relationship. At first, I feared that something was going on with Rhage and the control of his beast, but as the book progressed I could see that it was something deeper between these two beloved characters. Ward shows that the changes within the Mansion and the with the brothers and their Shellan’s are starting to affect and make the others re-evaluate what they want for the future. This is despite the current war with the Lesser’s and the Omega. It has handled beautifully and we see the expanding families is not only affecting Rhage and Mary, who are this books main focus, but also V and Jane. Ward shines a light on them all and it is done in such a subtle way, that you don’t even realise it. 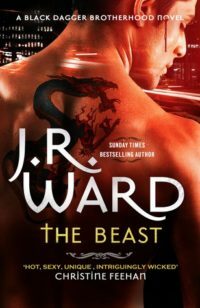 For me, The Beast is the book that once again shows that Ward is recalibrating the series and it looks like it is evolving once more. The thing that I disliked about The Shadows (the lack of development in the war with the Lessers) was once again present and while at first I thought this would once again mean I would find that this book was going to be a chore to read, there was so much more going on that it didn’t bother me. We have three sub plots that made up for this and kept my attention throughout the book. Two of these; Layla and Qhuinn’s young’s impending birth, along with her complicated relationship with Xcor, and Assail’s “partnership” with brothers, were compelling reading and at the end of the book Layla, Qhuinn, Blay and Xcor are starting new chapters in their life, much is still unresolved. In the case of Layla and the forbidden attraction/romance, there should be some sort of resolution to this in the next book, already announced, called The Chosen. There is also one sub plot line that took me by surprise and the ramifications for the series as a whole are yet to be seen. It is a big game changer and I can’t wait to see how it will affect the bigger picture. Like always, Ward has given us a few breadcrumbs for potential upcoming plot lines and there is a particular nugget that had me re-reading the paragraph two or three times. The character in question is new to the series and at first I was unsure what part they were to play. A few bits of their backstory did seem to suggest that they were half vampire and I went along with it because I wanted to see how it all panned out. When Ward does drop the clanger, my jaw dropped and I had to applaud her on this reveal. I didn’t see it coming at all. The ending of the book brought a lump to my throat and it was a sweet ending, especially after the last books ending. Closing the book, I knew that Ward had pulled me back from the brink of calling it quits on this series. The Beast is a true return to form for me and by focusing on characters that I had built such strong feelings for, I became so much more heavily invested in the outcome of the parties involved. I laughed, I got choked up and I was rooting for Rhage and Mary. Yet, by the books conclusion I fell for one of the characters who I had little feelings for. That character was Assail and I now see there is much more to him than meets the eye.